It’s been a week since I got back from my first trip to AfrikaBurn and it’s taken that long to process why I found it so extraordinary.On the surface, there is an astounding amount of effort and creativity: an entire town laid out for 7,000+ people, including dozens of artworks, some over 40 feet high, burning mechanical dinosaurs, laser shows and a non-stop cacophony of parties and performances with enormous sound systems, all constructed in an inaccessible desert with materials and equipment from hundreds of miles away, then taken down to leave no trace. However, the scale of the effort, while mind-blowing, doesn’t capture the heart of AfrikaBurn at all. For the whole week, I didn’t see a single fight or hear a single argument. It was like walking into a world made up of nicer human beings. Everyone was not only friendly, but wonderfully generous with whatever they had. One camp laid out an astro-turf lawn and built a swimming pool (with rain tanks of water carted hundreds of miles to fill it up). Another offered hot showers until their water ran out. A camp near us, built a gin palace, stocked with 30 types of gin and an endless supply of tonic, ice and lime. 24/7. The Stasie Kafee, served white wine in the day and red wine and boerewors rolls at night. Other camps made pancakes. A professional concert pianist under a wicker pagoda played sundown classical concerts. A bakkie converted into a pirate ship complete with masts, sails and hammocks cruised lazily around all day draped with 20-30 children and laughing adults. For those of you that have never been to AfrikaBurn, all this was provided with no money changing hands and no barter. All the ‘attractions’ are gifts. If I had to use one word to describe what makes AfrikaBurn different to say Glastonbury or other huge events, that word would be ‘participation’. 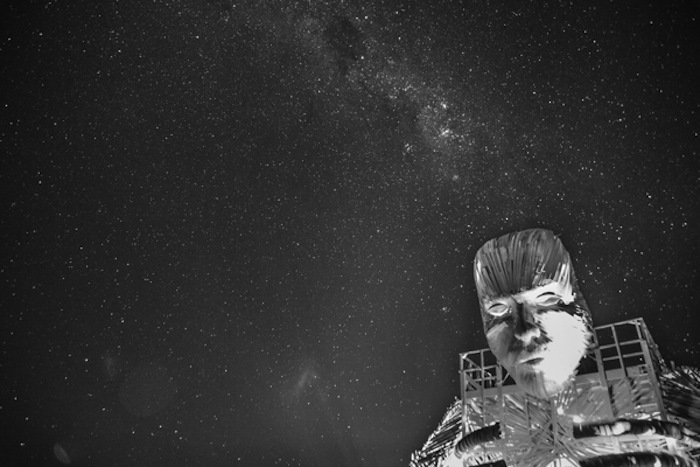 Afrikaburn has organisers, but they are very much in the background. What you see and experience is not the result of a central organiser, but rather the result of what the ‘citizens’ put in. The difference this makes to the overall energy of the place and people’s attitudes is difficult to describe. It becomes a real community. A crazy, unpredictable, helpful, friendly, open-handed and explosively creative community. 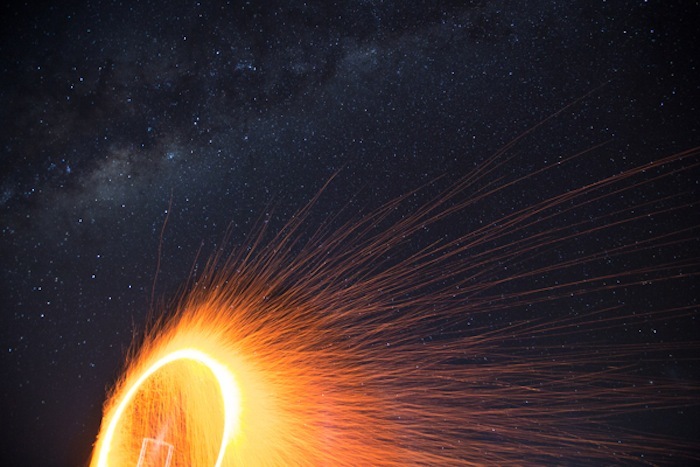 The values that drive AfrikaBurn (and other Burning Man events) are: communal effort, participation, civic responsibility, immediacy, decommodification, gifting, leaving no trace, radical inclusion, self-reliance and self-expression. You can read first hand what these mean here. I read that before I went, but it’s one thing to understand the ideas and quite another to find yourself in a money-free, barter-free community full of people expressing themselves in whatever way they choose and committed to doing so with no trace left on the environment! As an experience I would recommend it to everyone, even the most cynical. It’s extraordinary to suddenly live in a community with very different ground rules and it is impossible not to be affected by it. For one, it proves first hand that how we relate to one another is infinitely fluid and how we exist, interact and transact in the ‘real world’ is only one option among many. Our communal reality is defined by common agreement around the rules of engagement and it’s easy to forget that. With a similar common purpose and common agreement, we could all choose a very different paradigm to live by. To experience that as a first hand insight, not an intellectual one, is no small gift. If this all sounds glassy-eyed and ridiculous to you, bear with me. AfrikaBurn is not without its problems and politics, both internal and external. 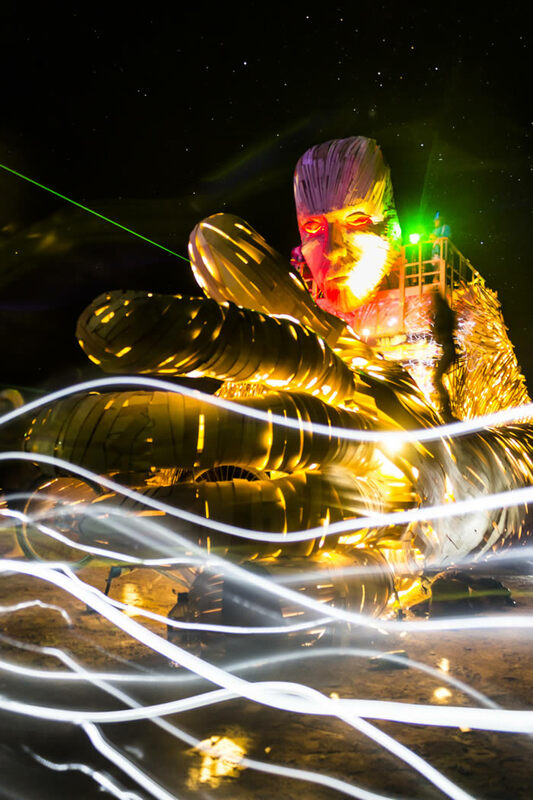 There is lively internal debate about improving and maintaining the values of AfrikaBurn, especially as it grows, and there is external criticism of AfrikaBurn itself and whether it has any significance at all. The internal risks to AfrikaBurn’s community are that people start ‘attending’ rather than participating. That you get more spectators than citizens and with that, the experience begins to disintegrate into just another party. Happily, there is constant discussion about this and how to manage it. For example, when I left Tankwa Town, I was amazed at how little rubbish was left given that 7,000 people lived there for a week. However, old community members were outraged by the amount of ‘moop’ (the BurningMan term for rubbish – ‘matter out of place’) and public shaming quickly started on Facebook, with vibrant debate about how to improve it next year. Who knows, maybe Tankwa Town will eventually have a police force for those that flaunt it’s values? It already has a Department of Public Works, a Department of Motor Vehicles and Rangers made up mainly of volunteers. So why not? The point is that the community is strong and that it fights and adapts to maintain it’s values even as the event grows. In fact it’s amazing how much more community involvement and action happens within AfrikaBurn versus my local real community. If someone fly-tipped in my Joburg residential street, I can’t imagine a similar response – more a resigned sigh. The external criticisms of Burning Man and specifically AfrikaBurn are as you would expect: That it’s basically a ‘thing rich white people do’. That it’s exclusionary because only a tiny slice of the population can afford to take a week off in the desert, with all the things they need for ‘radical self-reliance’ (water, food, shelter etc). 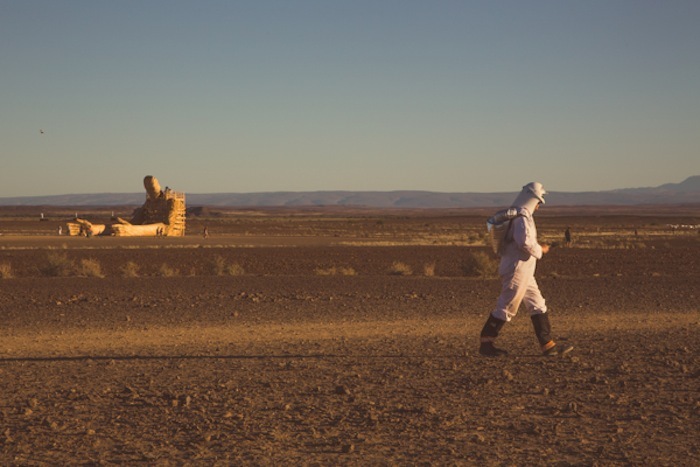 That gifting and decomodification are all well and good, but all the stuff that makes that possible is provided by the ‘real world’s’ usual capitalist system (the clothes, food, lasers, paint, etc) and that rather than ‘leave no trace’ – AfrikaBurn just moves the traces elsewhere. Many of these criticisms have some validity. It is terribly ironic that in order to live in a free, expressive, inclusionary, decommodified community for a week, you need to have generated a significant amount of wealth in a far less free, less inclusionary, heavily commodified system. However, does irony mean we should just give up trying to live (or at least experience) a different type of life? There is an unavoidable real world cost in making an event like AfrikaBurn happen and irony be damned. The event is non-profit and there is already progressive ticket pricing, making it cheaper for those with less means. 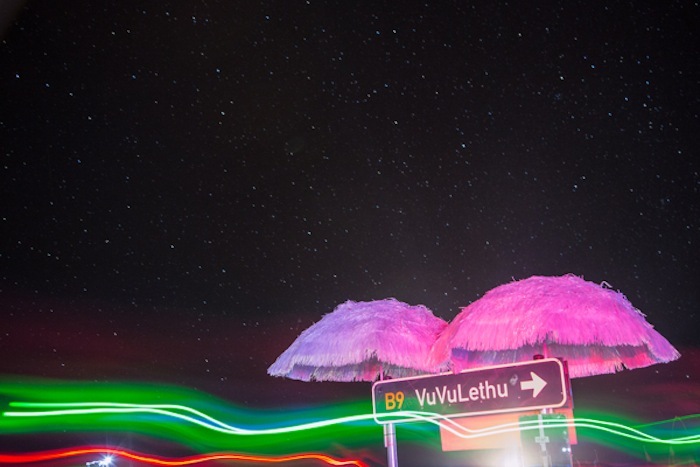 These aspects are admirable, but more effort can and should be made to make AfrikaBurn even more inclusive. The founding of a ‘bursary fund’ where artists and eager participants could apply? Encouraging attendees to sponsor others to come? Educating the local Karoo communities about the event and inviting them to participate? There are many avenues available that haven’t been tried. Trying to build a temporary utopia within modern reality can never be perfect (or free of irony), but imperfect is better than nothing. 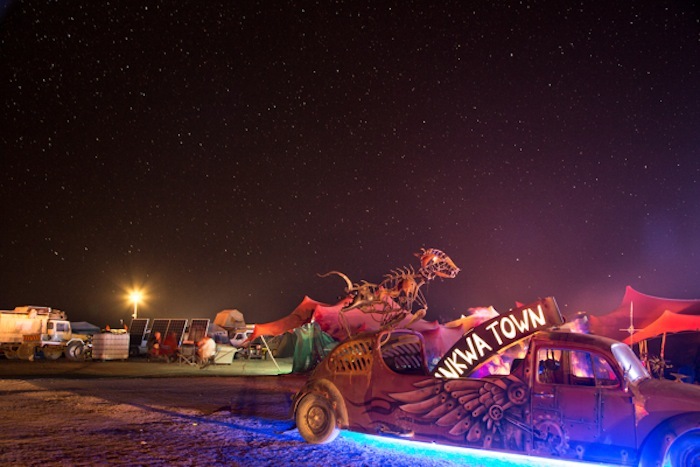 The value of expanding the reach of the AfrikaBurn experience to more people seems a no brainer: South Africa could surely only be improved by exposing more of its people to an expressive, inclusive and participatory community. Even if that exposure is brief, what opens up for each person is unpredictable, but almost certainly positive. I am looking forward to next year already. The organizers and attendees do include less fortunate people. Last years “Ubuntu mashup”saw 50 less fortunate sponsored people joining in the participation and enjoying the festival. The core team raised funds for them to do this. “Afrika burns” is also rebuilding a local Karoo school that burnt down last year. Do a bit more research. Nicely covered, though I agree about the kak headline. Thanks Simon. Always interesting to read the perspectives of new burners. The thought of a ‘police force’ to enforce the events’ values is in my mind a devolution and step backwards of its current trajectory. The organisers provide infrastructure and fundamental logistics, but the values need to be ‘enforced’, or rather upheld, by the citizens. you do your own part and remind others to do the same. If need be, that reminder should be passionate.The notion of enforcing anything goes against the grain of the event. People will ‘get it’ slowly through the experience. Its the education of what needs to be ‘enforced’ that needs more attention. All I can say is well done guys, I’ve not been there but my daughters and their friends have been for a few years now and they speak well of the event every time and can’t wait for the next one to come along. All of the best for the future. @rich, I am certainly not saying that the event doesn’t make an effort to be more inclusive, it does (and i gave some examples) I’m just saying that more could be done. And I hope that more is done because the experience should be open to as many as possible. @colin, the ‘police force’ was more a point than a reccommendation-, I’m not advocating it, just trying to say that internally the AB community is very aware of policing itself and getting the community on board to protect its values. As for the headline and the Facebook leader, nothing to do with me. A rave is exactly what AB is not and I don’t think that AB is a a new paradigm for the world to live by, just that it makes it clear that other paradigms are possible. @bobbito we’ve all read Montle’s article from last year. Your quoting it adds what to this conversation? Thanks for a lovely read, and some really gorgeous images. You make some specific suggestions around how more could done, and these are really interesting. Are you aware of the creative grant program? 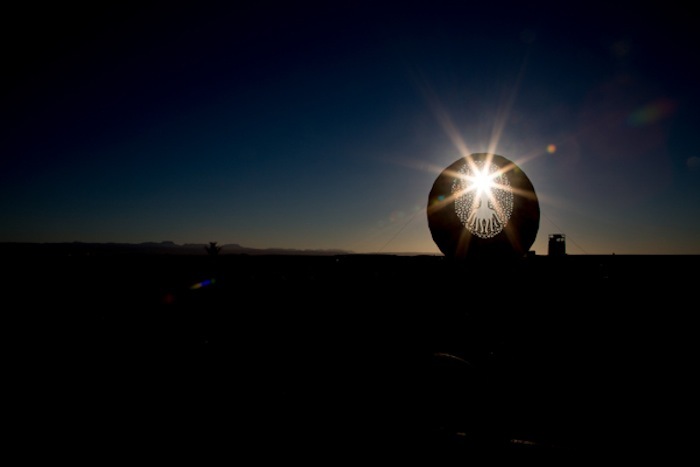 Art@afrikaburn.com would be able to tell you more about it. In terms of encouraging attendees to sponsor others to come – I don’t know if I like the idea of formalising it so much. Gifting is a spontaneous act from the heart. It loses something if someone told you how to do it. I love that you’ve put it out there, because now its an idea with legs and maybe it’ll wander off into a couple more minds. It definitely happens already though, and has done since the first event. It happens on a small personal scale with many individual burners, and it is happening on a larger scale in some theme camps. It’s a subtle thing. A community is built one individual at a time. Top work, Simon. Eloquently stated, love it. Stunning article Simon. Loved the photos too Andrew. what a great read. in many ways you have gotten and translated the unique magic we shared for a little while. and when it was over, I actually wondered whether it had really happened, or was just a mirage in the desert. a transient illusion. Thank You for insightful writing! Great article Simon. It was my first Burn too. Some friends and i trekked from Durban and set up the Afrika Burn Prayer flag installation. It was beautiful experience seeing people interact with your vision and. It was a mission to get there and cost money for the trip and installation but was one of the best things i have invested time, money and effort into. As you said , i would recommend it to everyone. I agree it would have to grow to let more people experience the magic, but at the same time i enjoyed the fact that there are limited ticket available. I loved the space you had when walking or riding around. You never felt squashed or intimidated by other people like you do at Oppikoppi, Splashy or Rocking the Daisies. I saw a video of Burning man recently and i just looked like another spring break party in the desert. Can an event keep its core values when there are 10-20 thousand people involved ? Its not just about the party, its about the interaction with others on the same wavelength as you. I cant tell you how stoked i was when i was handed fresh french toast by a total stranger, on the way to a Free hot shower ! These principles can be taken into other festivals and should be ! Especially the leave no trace ideology. The tickets are actually released in tranches 450, 650, 750. So if you book early you get a better deal. That said, a Justin Bieber ticket is R750 for one night. This is 5 days. Also I don’t think there is actually that much money in it for the organisers. There are grants given to artists and theme camps, there is security and the digging of hundreds of toilets, security and payment to the owner of the land etc. Probably enough left over to fund an organising committee, but I think you are mistaken if you think it makes a lot of money. It’s still out of reach for most in the country, but I don’t think the problem is greed on the part of the organisers. Perhaps someone more knowledgeable could wade in? THEN WAKE UP AND STOP BEING SUCH A FOOKING SPECTATOR WITH MOOP DRIVELING FROM YOUR QUIVERING LITTLE MOUTHS!!!!!!!! Become a participant in your own life…so that participating in the world out there becomes second nature to you, then you go back to the burn, step into the binnekring, slowly take an appreciative 360 look around yourself, push your chest out and say….. HOW DO I MAKE THIS BETTER? WHAT CAN I DO TO MAKE A DIFFERENCE? WHAT DO I ADD TO THIS WONDER? And then you drop to your knees and thank every person who came before you for their incredible selfless efforts…and while your down there see that little speck of moop…reach out pick it up…put it in your pocket…jump up and celebrate that you are standing in the center of the biggest collective pool of love that you will possibly ever experience…and its free…a gift, like everything else around you( o goodness I can hear you interrupting in that little quivering voice” Ja ja but it cost sooooo much money to get it all here….Lesson…AB is about being in the moment and IN THE MOMENT IT IS ALL FOR FREE(except for the bloody ice… I so don’t get that!!! ), and in the moment is the only time you can CO CREATE and MANIFEST. These are tools that you can take into your daily life and change from a “I don’t have” reality to a “right now I have everything that I can possibly need” GET IT!!!!!! !